StencilGirl Talk: Oil Painting with StencilGirl® Products! Oil Painting with StencilGirl® Products! Hi there! My name is Heidi Smith and I am super excited to be featured today as a Guest Designer for StencilGirl® Products! 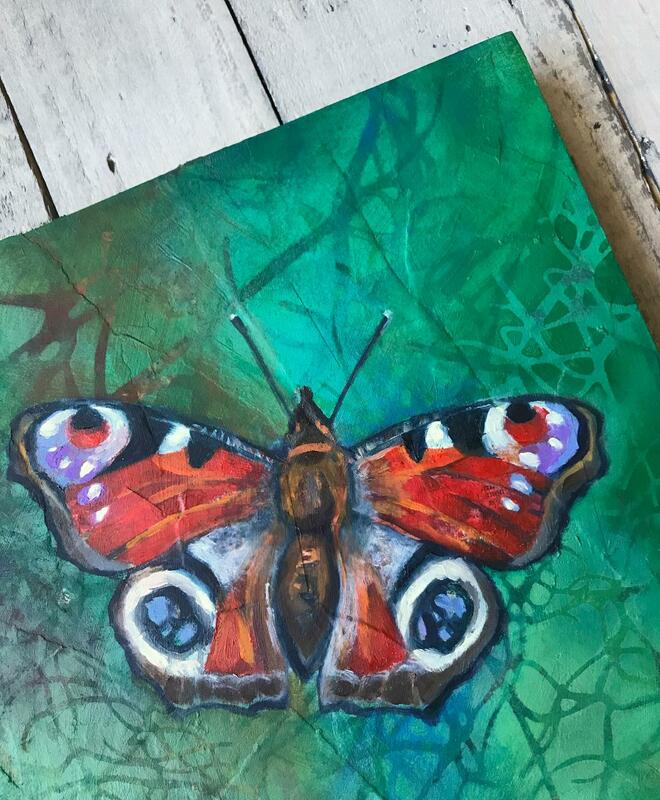 I am a mixed media painter and would love to share the steps I used for creating this fabulous acrylic/oil-hybrid Peacock Butterfly painting!! 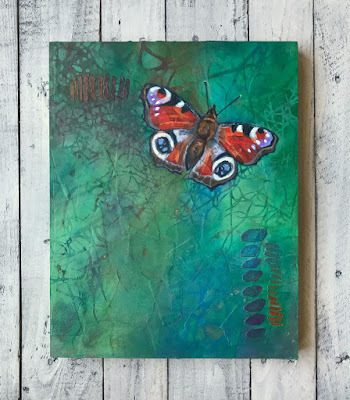 I will be using one of the fantastic butterfly designs from Gwen Lafleur's Boho Butterflies stencil as my focal image and Trish McKinney's Intertwining Spanish Moss, Lacy Spanish Moss, and Dripping Spanish Moss masks to create some very interesting background texture. I will add a little bit of colorful dimension (like sprinkles on a cupcake!) with Traci Bautista's Soulful Scribbles Dot Dash stencil! This project has 5 steps! For this painting, I like to start with some collage on the first layer because it will show up in the finished work to give a bit more visual interest. 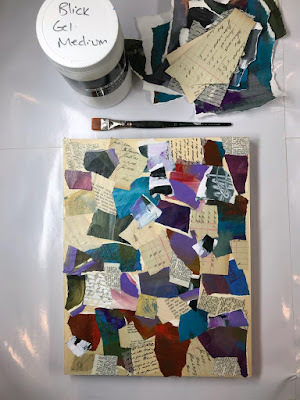 To start, I take a bunch of "junk" paper (painted paper scraps, old ledgers, and book pages - literal junk) and tear them into pieces. I collage these bits pretty randomly to the surface of an 11" x 14" wood panel with gel medium. 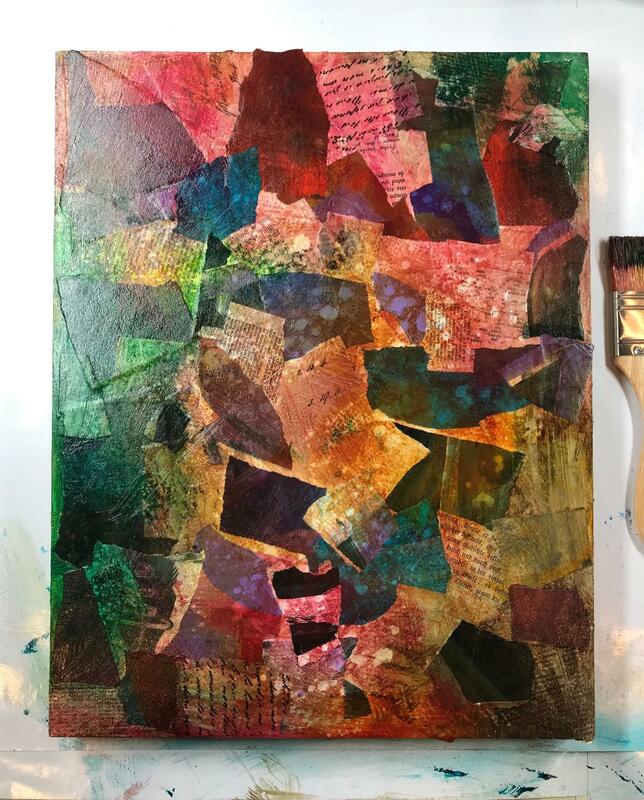 After the collage has dried, I add a layer of Golden Fluid Acrylics in transparent washes of color. This unifies the paper pieces and creates a darker ground to work on. I find that Golden's Quinacridone Magenta, Primary Magenta, Quinacridone Nickel Azo Gold, Hansa Yellow Medium, Phthalo Turquoise, Primary Cyan, and Permanent Violet Dark work well for this. I am pretty random with my colors and don't mind when they mix together because I like the colors that result. I sprinkle a little bit of water on the surface and blot up after about 30 seconds to a minute to create another kind of interesting texture. I also blot up some paint with a damp paper towel if I feel that things are becoming too dark. As you might have guessed, I like texture! So to add a little more dimensional pizazz to my paintings, I like to add modeling paste in a couple of areas. The painting will be more interesting if we have multiple areas of interest (which we will highlight in Step 5). I like to give myself structure by first deciding where on the panel I will place my focal butterfly. I use a white charcoal/chalk pencil and my Boho Butterflies stencil to outline the Peacock butterfly. Then I decide what parts of my Soulful Scribbles Dots Dash I will be using and apply blue painters tape to mask off those areas of the stencil. 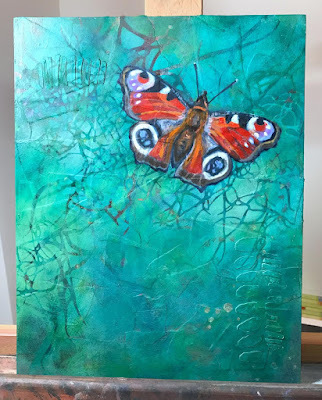 I apply modeling paste (I used Golden Molding paste) with a palette knife through the stencil and let this dry overnight. This step is the most intensive in my opinion, probably even more-so than the oil painting, which will be the step after. 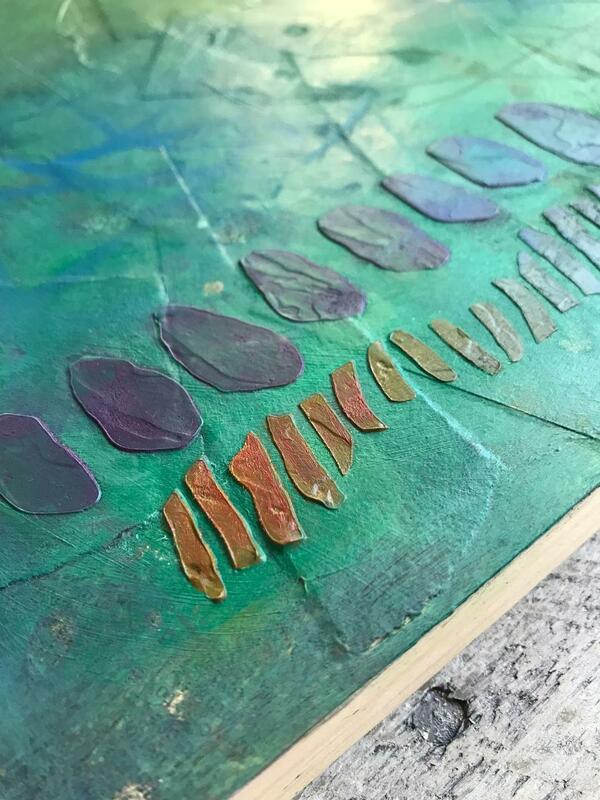 For this stenciled acrylic layer, we will be applying opaque and transparent layers with Golden Heavy Body acrylics while using our three Spanish Moss masks. I start by mixing a bunch of paint in various hues. You want to do this because the paint consistency will be slightly tacky while you're working and you don't want to have to stop to mix a color. You probably won't use it all, but better to have quite a few color choices. To make color mixes that are more opaque, I add Titanium White or an N5 Neutral Gray to my green shades. I chose Cobalt Green because it is more opaque and Phthalo Green (Blue Shade) and Green Gold because they are quite transparent. It is important to know which is which when we're layering. I also snuck in some Primary Cyan blue at the end for even more variety to my color range. So my biggest secret (shhhhhh!) is probably the brush that I use to dry-brush-stencil! Well, the first secret is that I have awesome stencils at my disposal, but since you're already here hanging out on the StencilGirl® blog, I will assume the cat's out of the bag on that one. So since tools can be quite important sometimes, I'll share what brush helps me out the most. The brush that I use is a DaVinci Series 111 brush, in size 12, which is a stiff-bristled, domed round brush. They are hard to find but definitely worth a search if you like this particular dry-brushed stencil technique. I do not rinse my brush while I'm working and can get away with it because my colors are next to each other on the color wheel. There is slight color variety, but my color mixes are all closely related. To be honest, layering my colors is mostly intuitive for me so I hope that the video will give some insight into my progression. 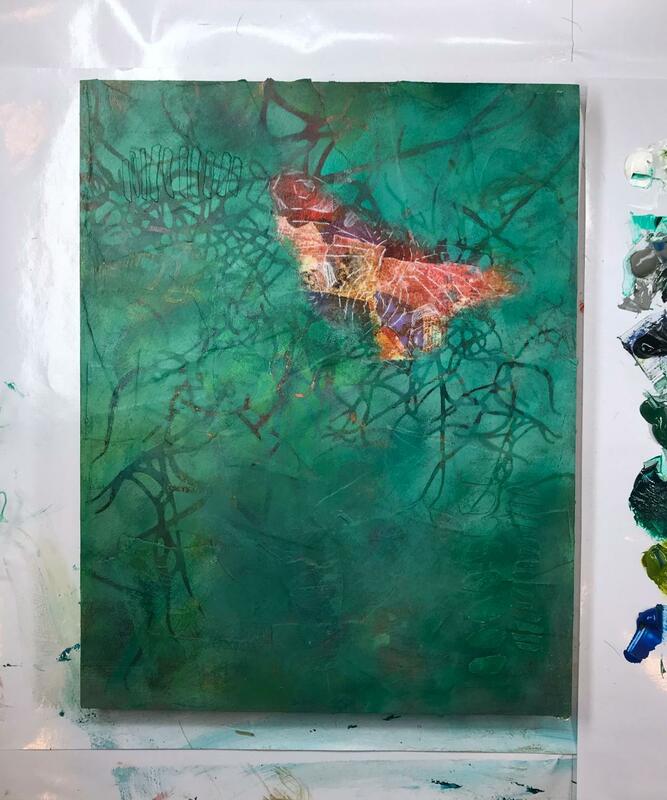 I tend to start with an opaque first layer, add a slightly more transparent layer to "push" the first layer back, then add an even lighter opaque layer on top. Then I will buff transparent mixes to blend it all together seamlessly. The other secret is to keep the masks from moving around, which is hard because they become tacky from the sticky paint, but to be honest they also sort of stay on the panel for the very same reason. You can always edit your painting slightly in Step 5 if you need more/less texture here/there later. I like to avoid the center of the butterfly so that some of the colors and texture from the collage will show through my oil painting later... and I also pay attention to the direction the moss is "flowing". The last secret is that I put a LOT of muscle into my dry-brushed layer. The paint is tacky and on the dry side so there isn't much paint to work with on my brush. I definitely scrub and pounce quite hard onto my panel and this is one of the reasons I like working on a hard panel. 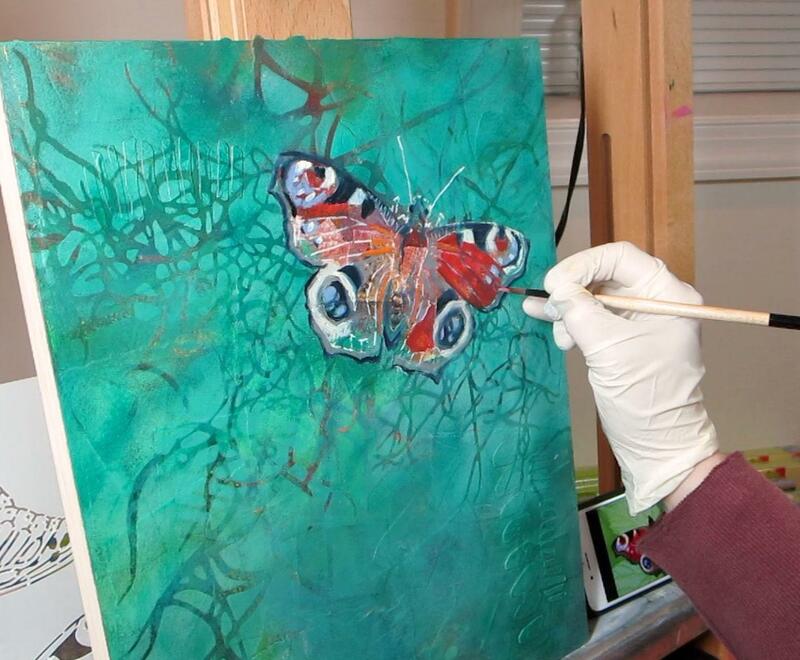 I load a small amount of paint onto my brush, tap most of it off onto a paper towel, and start working closest to my butterfly or in the center of the mask - pouncing to start. I pounce especially in the areas of my mask that are "tight" and gradually work into a circular dry brush motion in more open areas of the mask or in open areas of my canvas. When I get to the edges of my masks where there are loose "strands", I will either pounce very forcefully or I will brush outward in the direction of the strand, if that makes sense, depending on how much paint is on my brush. After these acrylic layers are finished and dried, I like to sprinkle a little bit of rubbing alcohol on a few areas, let it sit for a minute, then scrub these tiny spots with a dry paper towel or a cotton rag. This gives some "sparkles" to the background. Totally optional... and also totally risky after all that work. 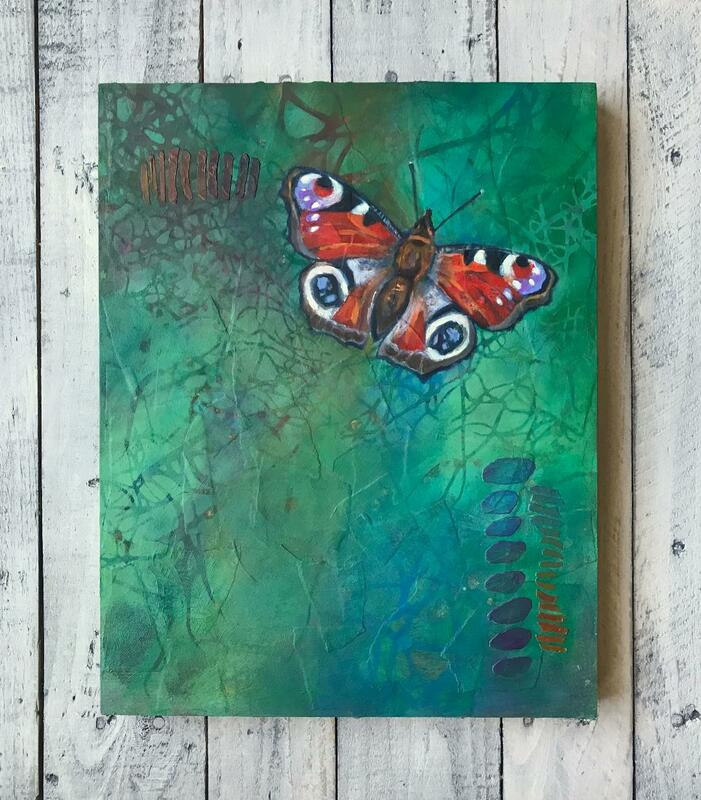 After you've stenciled around your butterfly, you'll probably have lost its edges and will need to touch up with your white charcoal/chalk pencil and Boho Butterflies stencil again. I used oil paint for this step because I like the push and pull that oil paint allows in my more detailed work. I don't have any particular oil techniques to share, but I can suggest that you start in areas of the butterfly with distinguishable marks (like lightest or darkest areas) and to follow the guidelines that Gwen has provided. Her stencil takes away ALL of the stress of drawing the butterfly's anatomy! 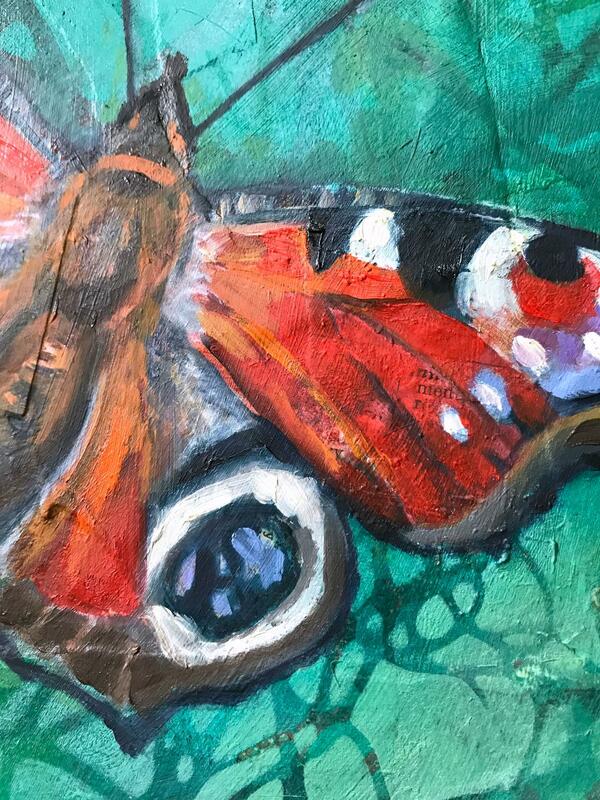 I use Winton oil paints and Odorless Turpenoid to thin my paint for detailed areas (like the antennae) or in areas I want to be more transparent (like the wing in the photo below where you can see text showing through) and I also use Turpenoid to "erase" any mistakes. I use my oil paints to touch up my background also (if needed). For example, if there are any alcohol "sparkles" I didn't care for or stenciled areas I want to add or subtract from, I mix up some of my background color and touch up these areas as needed. I have an oil-dedicated DaVinci brush that I will use with the same stencils if I want to add anything. 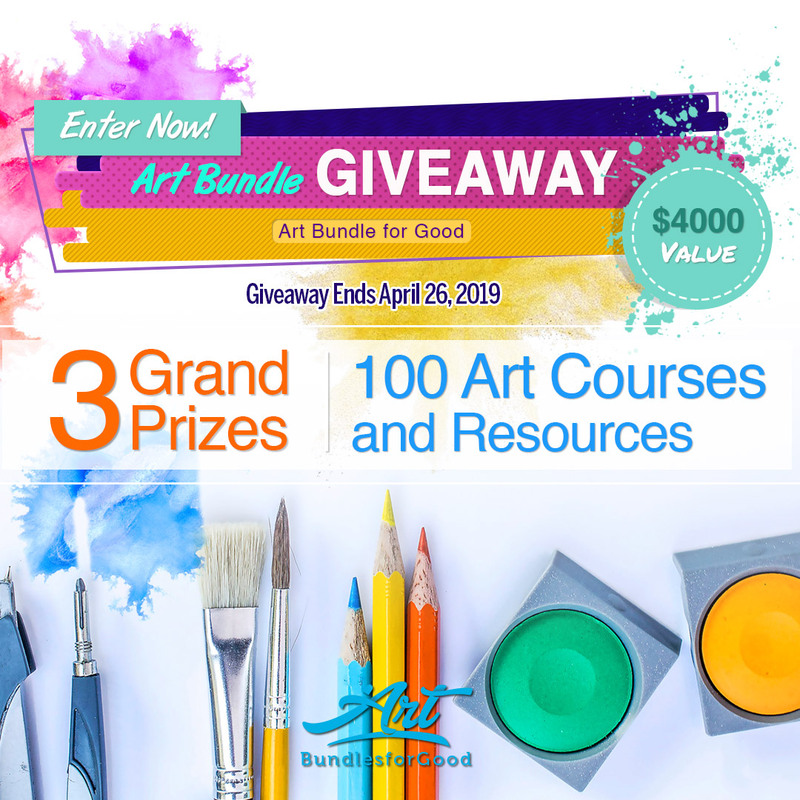 Though I should mention that once you have crossed over into oil paint, you shouldn't go back to your acrylics and I don't recommend that you mix up your paintbrushes. My stencils are perfectly happy going back and forth and I just make sure to wipe off any oil paint with a cotton rag. I should also say that you could totally do this step with your acrylic paints, it is simply my own preference to use oil paint. There are two last finishing touches that I have added. After Step 4 has completely dried, which takes a few days, I've buffed on a layer of transparent oil paint onto some areas of the background to make the painting have a colorful "glow". I have also done some reductive stenciling in areas. Lastly, I've applied some colorful touches to the raised areas (where I'd applied modeling paste in Step 2). 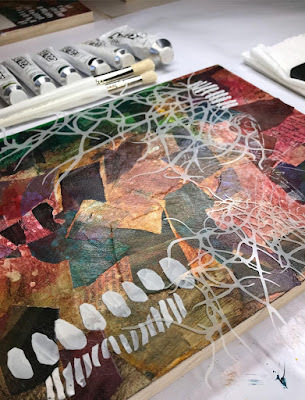 I use the Soulful Scribbles Dots Dash stencil with my oil paint to stencil just in the raised areas. I think this finishes off the painting nicely! I hope you've enjoyed following along with me and I really hope that the video is helpful! or on my personal Facebook page (https://www.facebook.com/artsyheidi)! 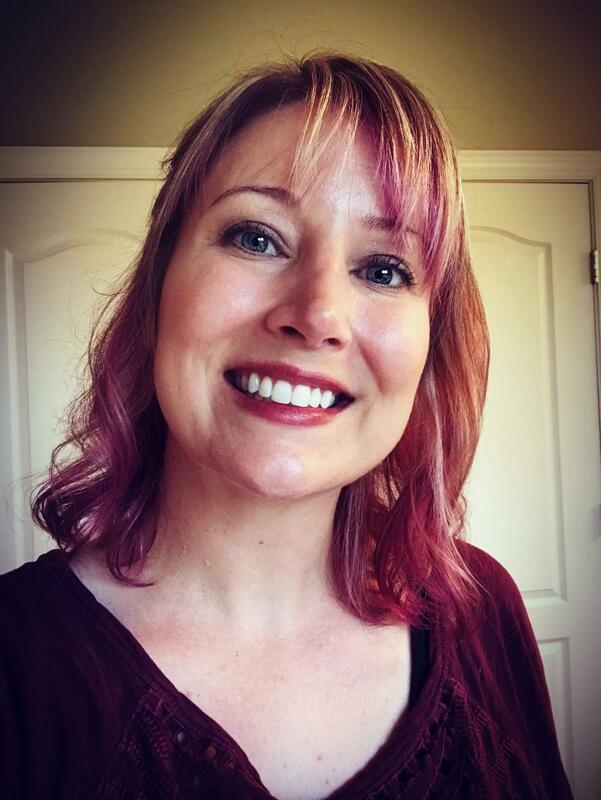 It's fascinating to see your detailed process - thanks, Heidi!